After listening to Frazer Henderson’s wonderful talk on Kyrgyzstan at the Wakefield and North of England Tulip Society AGM in 2015, I was all fired up to look for tulips in exotic places. Soaring mountains, alpine lakes, and beautiful, beautiful flowers growing wild in the rocks – I wanted to see them myself. Sure, there were a few challenges – transport, housing, and blood sucking fauna – but it all seemed to fade in the background when I remembered his photos of cobalt blue lakes beneath snow capped peaks. It also seemed very affordable, provided you didn’t mind the occasional meal of horse meat. When I received an email asking if I were interested in joining a small group of enthusiasts on a trek to Uzbeki-stan, I leaped at the opportunity. I, too, would become a species spotter – a true tulipomane! We started our trip in Istanbul, which was off the official itinerary but a wonderful place to begin, as the annual tulip festival was in full swing, with the Emirgan Korusu park covered with acres and acres of late Dutch tulips in gorgeous displays. Our group of five – Frazer, myself, my husband, and WNETS committee members Teresa and Jason Clements – took some time to visit the tulip museum in the park and then to stroll around admiring the densely planted gardens. Entry was free (although distant from public transport – a taxi would be helpful), and families were everywhere: picnicking, taking photos, and enjoying the perfect weather. From this hilltop perch, we dashed to a field between the Hagia Sophia museum and the Sultan Ahmet mosque, where a giant carpet of tulip blossoms had been made as a part of the festival. I was surprised that I hadn’t heard more about this festival in the UK – in richness of displays, it seemed more than equal to Keukenhof, but with the added fun of Istanbul and its treasures surrounding it (and no entry fee). Exploring a pasture of tulips beside a mountain lake. Among the crags and ravines beyond many rare tulip varieties lurk. Would we get to them before the local goats (who consider tulips a delicacy)? After our busy day, we had several hours of free time to dine and repack, for all of us were on the same flight to Tashkent – at midnight. Uff! Our Uzbekistan adventure began properly the morning of April 13th, where we were met at the tiny Tashkent airport by Yuri, our Uzbeki tour guide, and transferred to our hotel in a residential district of Tashkent. 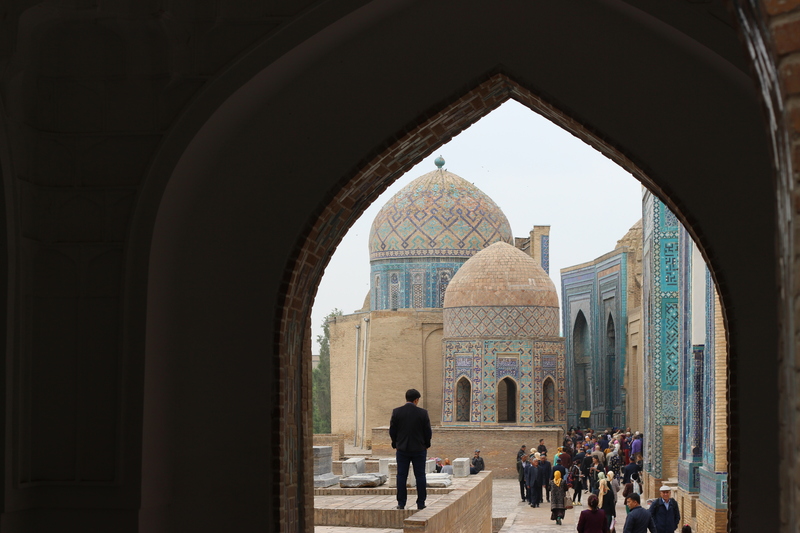 The pilgrimage site of the Shah-i-Zinda mausoleum includes the resting place of Qusam, a cousin of the Prophet Mohammed, as well as numerous members of Tamerlane’s family. There we found Karsten, a German anesthesiologist, who would round out the tour group to six. As we headed into our vans the next morning, we met Ivan Maltseva, who would accompany us as our botanist. 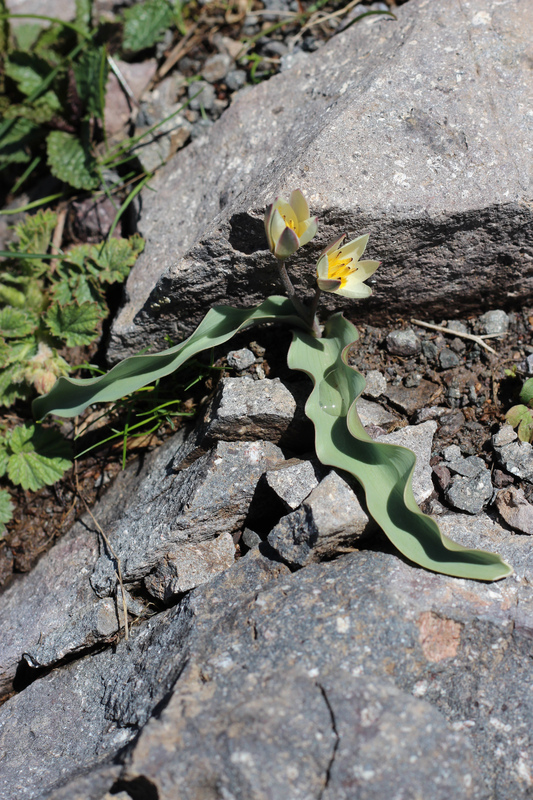 The next morning we undertook a lengthy drive to the farming villages of the Nurata mountains, where, on our very first hike, we found a few examples of Tulipa Korolkovii on the shale slopes. This stubby pinky white/red wonder (it had two forms) had the most gorgeous curlicue foliage. As a bonus, we saw a chamoix in the distance – all this just a half hour walk from our guesthouse. It was a promising start! From then, our days alternated with long drives between tulip biomes, sightseeing in ancient cities, and hikes in remote landscapes that varied between twinkling alpine meadows scrub desert, and the kind of sandstone canyons that made you think Indiana Jones was just around the corner. 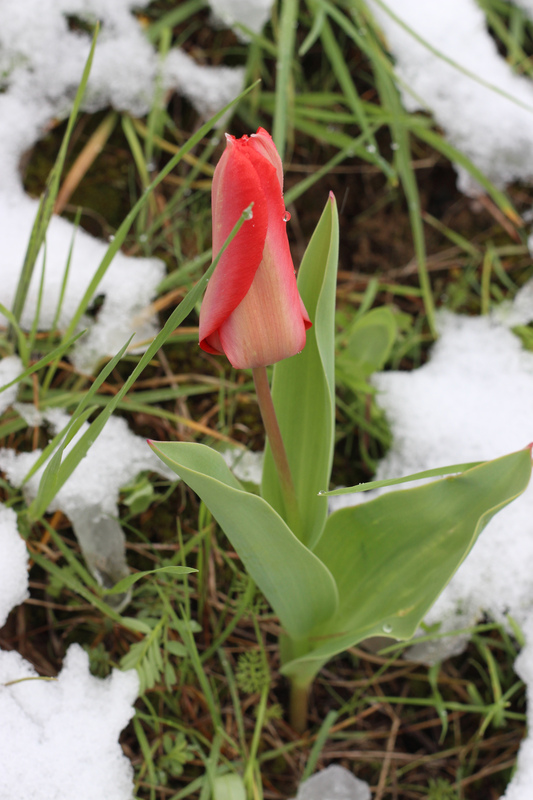 A Tulipa ingens nestling in the snow at the Kitab State Geological Reserve. It quickly became clear that while it might seem that our enemy was the weather – fog, freezing sleet and accompanying mud – the true villain of this trip was the goat, which time and again seemed to have beat us to the tulips, leaving behind close cropped stems and a few leaves. 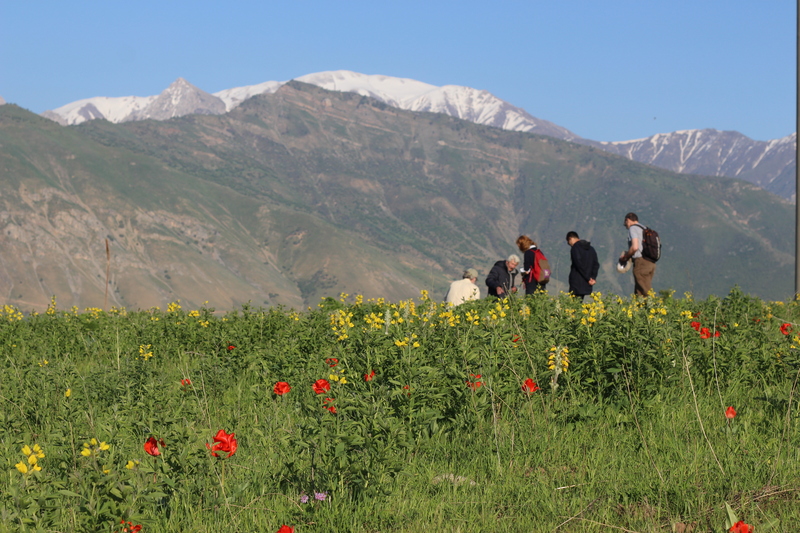 We had arrived in time for blooming season, but could not beat the hungry hordes!Our best days of tulip spotting were spent in mountain preserves too remote for grazing herbivores. 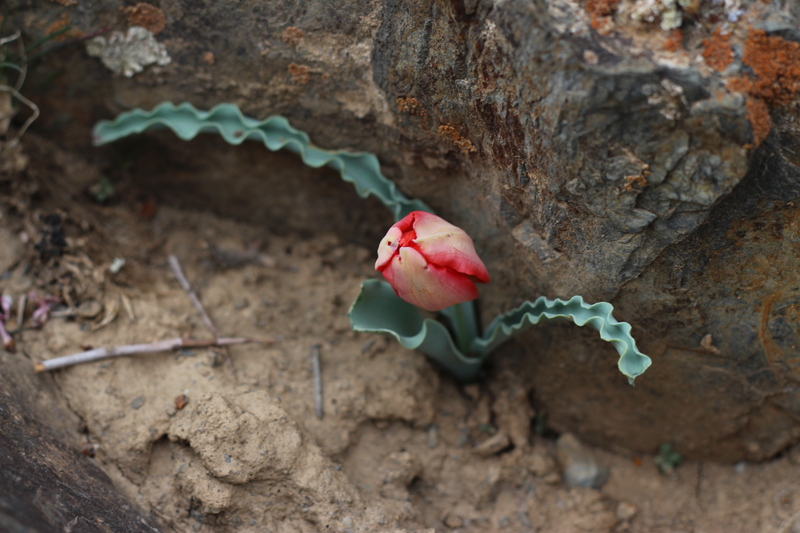 In the foggy, freezing Takhtakaracha mountains near Samarkand, we saw Tulipa ingens and Tulipa Fosterianii amid the grass, moss, boulders, and clag; within the gorgeous Kitab State Geological Reserve (where we were as interesting to the park rangers as the tulips were to us) we found Tulipa ingens and Tulipa Fosteriana hiding between patches of snow; and in Boison we enjoyed central Asia curving away from us after we took our pictures of Tulipa Korolkovii and Tulipa lanata. 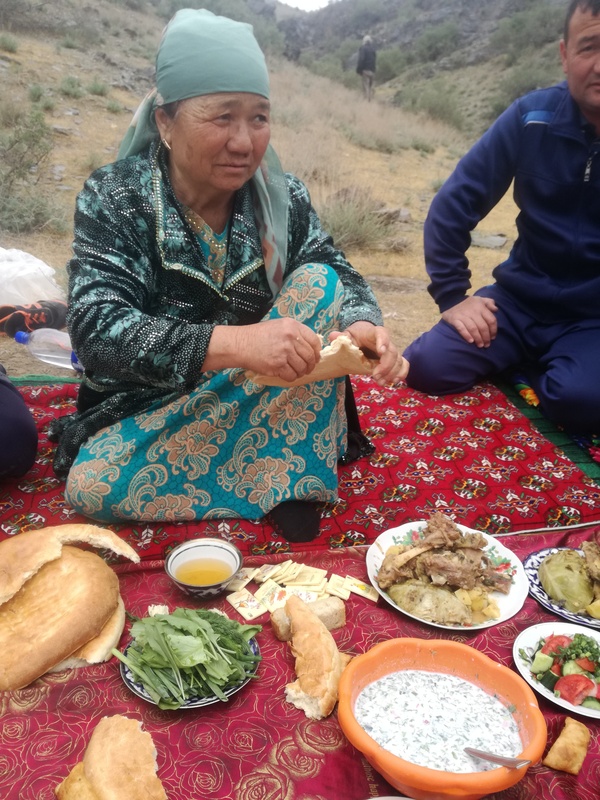 An Uzbeki family near Nurata having a Sunday picnic of lamb stew, flatbread, and tea. We also enjoyed some outstanding architecture and enjoyed the pleasures of a country where civilization has flourished since before the rise of Christianity. You can hardly escape learning about Emir Timur, called Tamerlane in the West, the national hero of Uzbekistan. His tomb, the madrasahs surrounding the imposing Registan square (the oldest built by his grandson in 1417), the turquoise Shah-i-Zinda necropolis (filled with Timur’s relatives), and the greatly restored Bibi-Khanym mosque (built for his wife) gave us a very rich time sight-seeing in our short time in Samarkand – with people from all over Asia queuing up beside us. While the tourism infra-structure is still a bit thin, the hospitality we were shown was genuine and joyful, including an exciting moment where we were invited to join an Uzbeki family for their Sunday picnic in the foothills near the city of Nurata (founded by Alexander the Great). Getting from place to place involved long hours in vans, but we took the opportunity to visit with each other, enjoy the scenery, and nap. The highlight of the tour, however, was the final Sunday, when we drove from Tashkent to the Beldersay mountains, a well developed tourist area on the border with Kazakhstan and Kyrgyzstan. We had a gorgeous drive into the mountains where we went to the station for a ski lift which continues running after the end of the snow for the benefit of day trippers who want to enjoy the magnificent views at the top. Our gondolas floated us over fields of yellow tulips – a huge change from the single stems we’d struggled to find in the deserts below! Tulipa biflorifomis produces tiny double blooms in cream and white. 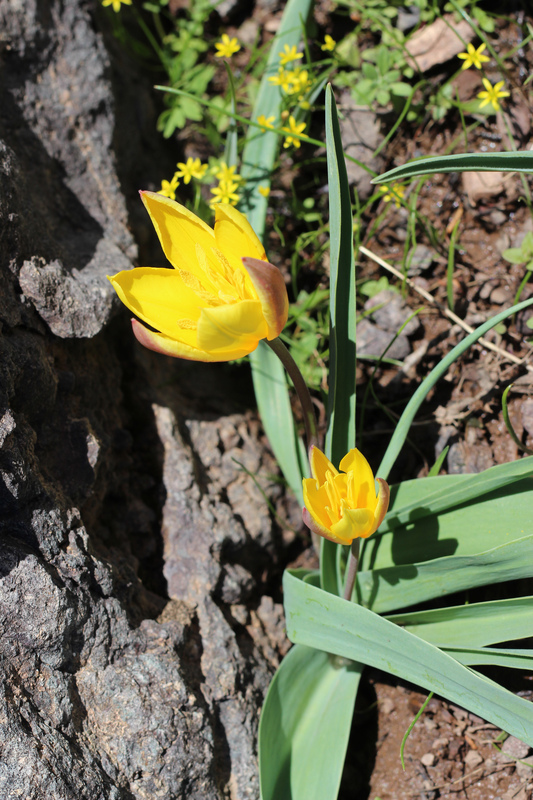 Tulipa Tchimganica is found widely in the Beldersay mountains.